Bernie was Annie’s pet Dutch rabbit. When she started the company, Annie chose him to be our official “rabbit of approval” representing the simplicity, care, and goodness in all of our products. Here at Annie's, we believe bunnies make everything better. We're constantly in the kitchen taste - testing our beloved Cheddar Bunnies to ensure they're as yummy as possible. 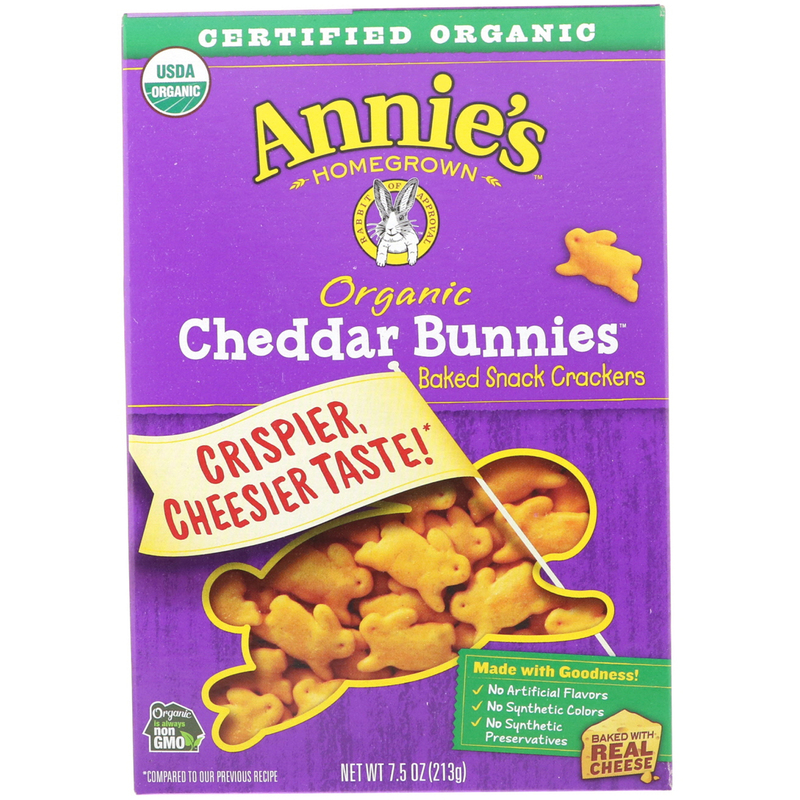 And because we're always bettering our bunnies, we've upgraded our classic Cheddar Bunnies to a New certified organic recipe! They now have a crispier, cheesier taste that's yummier than ever. Now its your turn to be the taste tester! It's a tough job, but somebunny's gotta do it. Organic wheat flour, organic expeller-pressed sunflower oil, salt, organic cheddar cheese (pasteurized organic milk, cheese cultures, sea salt, non-animal enzymes), baking soda, organic yeast, organic paprika, monocalcium phosphate, cultured organic milk, organic nonfat dry milk, organic annatto (for color), organic onion powder, organic celery seed powder, enzymes. 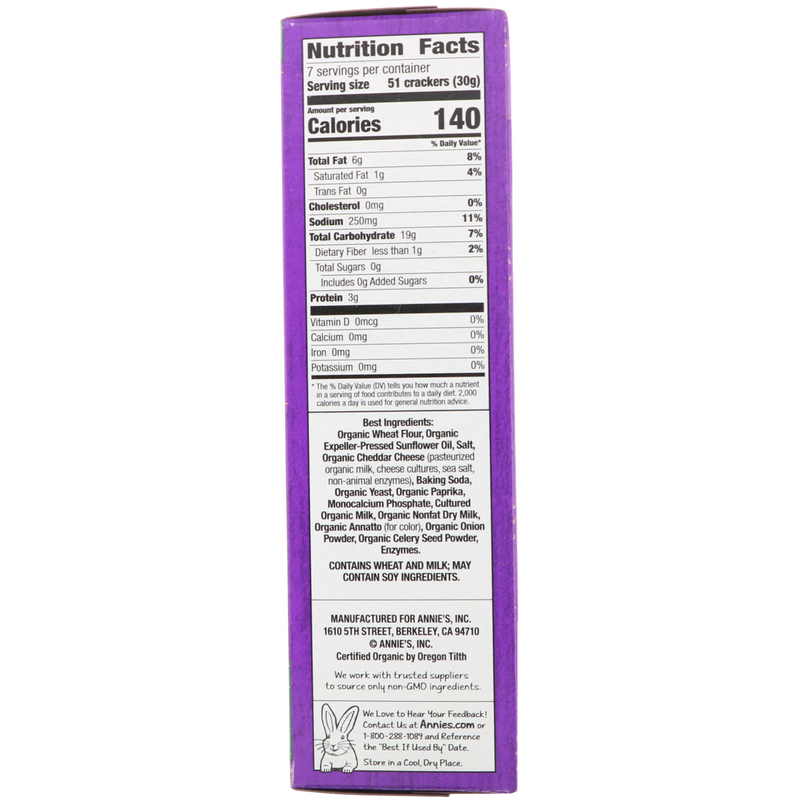 Contains wheat and milk; may contain soy ingredients.